Like me, you don't want you to spend your time on the internet looking through information you might not need or want. You want what you are looking for, right? That's why I've created this blog page to give you easy access to the topics on your list. The whale shark has gotten its name for its bus-size dimensions. Unlike whales however, it's not a mammal but a collossal fish, the biggest in the ocean. Among Yucatan wildlife are many endangered animals and plants, listed in various categories of the IUCN Red List of endangered species, like sea turtles, spider monkeys and whalesharks. Continue reading "Endangered animals in Yucatan"
Continue reading "Yucatan luxury hotel rooms"
Travel guide to the Yucatan Peninsula, Cancun, Riviera Maya, Costa Maya. 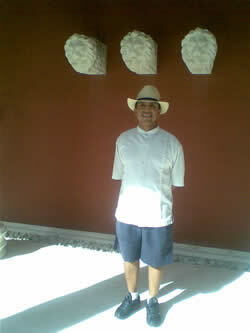 Yucatan Peninsula travel advice, insider information, Yucatan photos. Continue reading "Contribute To Beautiful Yucatan Peninsula"
Is Cancun swine flu free? Can you travel safely to the Riviera Maya? Continue reading "Cancun swine flu"